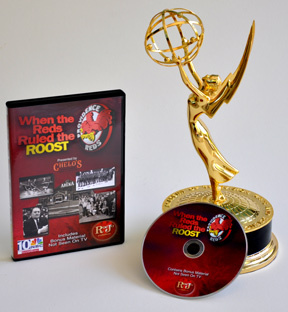 Providence, RI (5/26/2010): “When the Reds Ruled the Roost,” presented by Chelo’s restaurants and narrated by the late great Boston Bruins’ legendary announcer Fred Cusick, has won the New England Emmy Award for best one-time sports television special in 2009. Joe Rocco, executive producer and writer of the documentary, was presented with the prestigious award at the New England Emmy awards ceremony at Gillette Stadium in Foxboro, Massachusetts, on Saturday evening, May 22nd. Rocco also accepted an Emmy statue for Jim Karpeichik, the exclusive videographer and editor of the program. The 30-minute program, commissioned by the 700-member Rhode Island Reds Heritage Society, will air again this summer and fall on RI PBS, Channel 36. The documentary is a compelling video history about the once immensely popular Rhode Island Reds. It includes rare film from every decade starting in the 1920s, lost photos and many colorful stories from former players, Hockey Hall of Famers, owners, general managers and coaches. This is the second New England Emmy Award victory and third nomination for Rocco, president of RocJo Productions and former WJAR-TV, NBC 10 sportscaster. Rocco and Karpeichik were busy for two years conducting interviews with former Reds’ hockey greats and collecting photos and film clips that haven't been seen in many decades. “I am confident that when people see this program on RI PBS Channel 36 or the DVD they will laugh, cry and be amazed by some of the film that is included in this documentary. Having Fred Cusick, the Curt Gowdy of hockey, narrate this program, was the icing on the cake,” Rocco says. The DVD can be purchased at www.rocjo.com where all retail outlets are also listed. A trailer and preview of the program can be viewed at rocjo.com as well. For more information please contact Joe Rocco at 508-336-5818 or Joe@RocJo.com.